The OnSiteMonitor is now publicly available! You can now download and install the application on your desktop computer. It is recommended that it run on a computer that is only used for the OnSiteMonitor application. This is because the software will be running 24x7 without reboots or being shutdown. The system is only active when the Console is running. 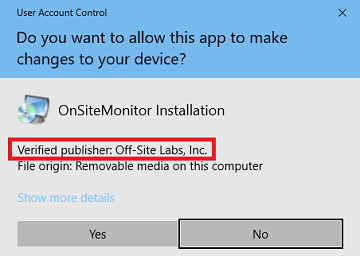 When you go to install OnSiteMonitor, If you do not see that Off-Site Labs, Inc. is the verified publisher, you need to download an official package from www.OnSiteMonitor.com. Our software is certified and safe if your download it from our web site.